Allison Krodinger and her emotional support dog Hucksley share a bond that allows him to know when she has had a bad day. 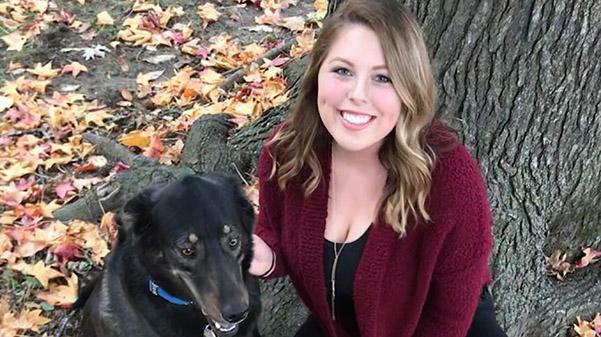 When Lindenwood senior Allison Krodinger has a panic attack in the middle of the night, she’s glad to have her dog Hucksley by her side. Krodinger said she thought she would have to deal with the attacks alone until she found a four-legged friend to help her at any hour. Krodinger is one of a growing number of students who are using either an emotional support or service animal on Lindenwood’s campus this semester. According to Jeremy Keye, coordinator for student support and accessibility, the number of authorized animals on campus has increased to approximately 41 students from about 12 of the 2,426 student resident population as of Jan. 31. To have an emotional support animal or a service animal on campus, a student must have medical documentation that details the diagnosis and the need for the animal as well as the completion of an application, according to Keye. Confusion about the differences between emotional support and service animals has led to some strange looks and questions, their owners say. Emotional support animals can be any animal that is legal to own in the United States, according to the Americans with Disabilities Act. Emotional support animals do not require any special training and are not protected under the same federal laws as service animals. For instance, they are not allowed in public spaces that do not allow pets. These animals can be used for many reasons, including to relieve stress, symptoms of depression, loneliness and even certain phobias, according to the ADA. Krodinger said she was diagnosed with anxiety in September 2017, and she got her 4-year-old German shepherd and black lab mix four months later. Hucksley is able to help Krodinger destress from a hard day and help her through her panic attacks. When her symptoms became too severe to handle on her own, she said she realized she needed an emotional support animal. Krodinger’s roommates in her on-campus house found Hucksley online and sent her a photo in a group text chat. They jokingly asked if they could get him, and she told them she really wanted him. Krodinger said her roommates love Hucksley as much as she does. They help her take care of him and watch him whenever she isn’t around. When any of her friends have had a rough day or aren’t feeling well, Krodinger said she invites them over to cuddle with Hucksley, and he smothers them with kisses. Krodinger’s roommate, Leah Frommer, said that Hucksley has been a wonderful addition to the house from the beginning. “The biggest way he’s been helpful to me is making me feel safer at home and also as a stress reliever,” Frommer said. Hucksley also helps Krodinger stay active, an important tool to battle mental illnesses like anxiety, according to health officials. The two go for a 45-minute walk once a day. Krodinger said she sees Hucksley helping her long after she finishes college. The Americans with Disabilities Act defines a service dog as any dog that is individually trained to do work or perform tasks that benefit an individual with a disability. Some of the most common service dogs are guide dogs, mobility dogs, hearing dogs, seizure alert dogs and medical alert dogs, that can detect heart attacks, diabetes and panic attacks. Mariah Plieseis has had her service dog, Betsy, a 2-year-old white lab golden retriever mix, for nearly two years. Plieseis has been training Betsy to help with her postural orthostatic tachycardia syndrome, which causes her heart rate to increase and blood pressure to decrease. This causes Plieseis to randomly pass out. Betsy always gets lots of love and treats when she is at home with Plieseis. When Plieseis passes out, Betsy can perform deep pressure therapy on her. “She will crawl on my chest and put her front half on my chest and lie there, and that brings my heart rate down faster so I’ll wake up faster,” she said. A dog can’t be taught to do that, Plieseis said, so when she got Betsy, she wasn’t sure the dog would be able to help. Plieseis said that it can be challenging being on campus with Betsy. People have asked to see paperwork, even though Betsy has been approved everywhere at the university. According to the ADA, people are only allowed to ask owners of service dogs two questions: Is the dog a service animal required because of a disability, and what tasks or work is the dog trained to perform? Plieseis said people constantly try to pet Betsy, whistle at her or take pictures of her, which causes problems because Betsy is still in training. The more attention Betsy receives, the harder it is for her to do her job, Plieseis said. “In a way you want to educate the people and spend the time to talk to them but some days you’re like ‘I really just want some milk, that’s all we are [at the store] for,’” she said. Betsy and Plieseis are still working together in training. Betsy goes to training school several times a week. Another situation that can be uncomfortable, happens when people ask her why she needs a service dog, Plieseis said. With the number of people relying on animals on the rise, it is important for people to understand the difference, Plieseis said, and to know that both are necessary. “Typically, the public does not take emotional support animals as seriously … whereas service dogs are specifically trained for their human’s disability and disorder, making it a necessity to have them for their owner’s safety,” she said. Data suggests that requests for emotional support animals and service animals will continue to increase over the next several years, according to Keye, coordinator at Lindenwood.